Dermatomyositis is a rare inflammatory disease. 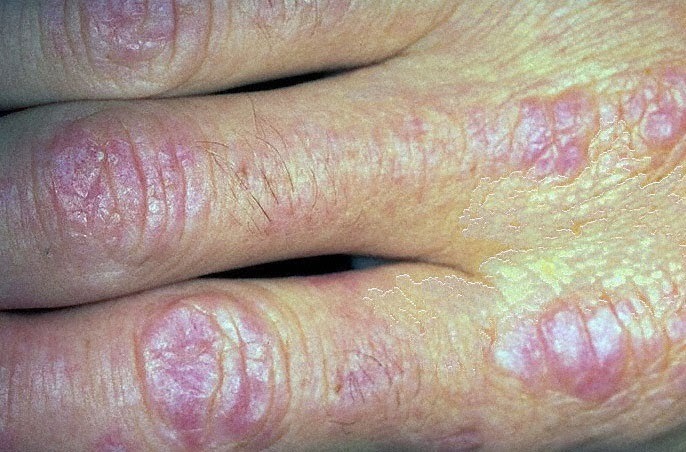 Common symptoms of dermatomyositis include a distinctive skin rash, muscle weakness, and inflammatory myopathy, or inflamed muscles. It’s one of only three known inflammatory myopathies. Dermatomyositis can affect both adults and children. There’s no cure for this condition, but symptoms can be managed. The cause of dermatomyositis is unknown. Experts think it may be due to a viral infection of the muscles or a problem with the body’s immune system. It may also occur in patients who have cancer in the abdomen, lung, or other parts of the body. Anyone can develop dermatomyositis. It most commonly occurs in children age 5 – 15 and adults age 40 – 60. Women develop this condition more often than men. The disease is treated with anti-inflammatory medicines called corticosteroids and other drugs that suppress the immune system. When your muscles get stronger, your doctor may tell you to slowly cut back on your doses. Most people with this condition must take a medicine called prednisone for the rest of their lives. If a tumor is causing the condition, the muscle weakness and rash may get better when the tumor is removed. The condition may be fatal in adults due to severe muscle weakness, malnutrition, pneumonia, or lung failure. The major causes of death with this condition are cancer and lung disease.